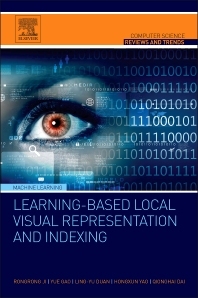 Learning-Based Local Visual Representation and Indexing, reviews the state-of-the-art in visual content representation and indexing, introduces cutting-edge techniques in learning based visual representation, and discusses emerging topics in visual local representation, and introduces the most recent advances in content-based visual search techniques. Discusses state-of-the-art procedures in learning-based local visual representation. Provides insight into how machine learning techniques can be leveraged to refine the visual recognition system, especially in the part of visual feature representation. Researchers, graduate students and academic faculty in the fields of artificial intelligence. More specifically, those who are doing research in computer vision, pattern recognition, multimedia technique, machine learning, and data mining. Professor Rongrong Ji , is the Director of the Intelligent Multimedia Lab at Xiamen University. He is an active researcher pursuing innovations in multimedia, computer vision and pattern recognition. His scholarly work mainly focuses on building cutting-edge computer systems to understand visual scenes, to retrieve visual instances, and to digest human behaviors, with emerging applications to mobile visual search and social media analytics. His recent interests include compact visual descriptor, social media sentiment analysis, and holistic scene. He has served as the guest editor of IEEE MultiMedia Magazine, Neurocomputing, Signal Processing, ACM Multimedia Systems, and the Journal of Multimedia Tools and Applications. In addition he has served as the technical session chair at numerous conferences including, International Conference on Multimedia Retrieval 2014, Visual Communications and Image Processing 2013 and the 2012 Pacific-Rim Conference on Multimedia, etc. He has over 900 Citations and a Google Scholar h-index of 15. Yue Gao is with the Department of Automation, Tsinghua University. His recent research focuses on the areas of neuroimaging, multimedia and remote sensing. He is a senior member of IEEE. Qionghai Dai is with the Deparment of Automation, Tsinghua University. He has published more than 120 conference and journal papers, and holds 67 patents. His current research interests include the areas of computational photography, computational optical sensing, and compressed sensing imaging and vision. His work is motivated by challenging applications in the fields of computer vision, computer graphics, and robotics. He is a senior member of IEEE.